Sword | Tai Chi Foundation Inc. The Tai Chi Foundation teaches the Yang family Sword Form and fencing as taught by Professor Cheng Man-Ch'ing to Patrick Watson. At Patrick’s request Tam Gibbs, another of Professor’s senior teachers, first taught the Sword Form to TCF students. Prior to learning the Sword Form a student needs embody the Tai Chi Form and have ample experience in Sensing Hands. It is often said that the Tai Chi Sword Form has much in common with Chinese calligraphy. The brush is held in the hand with utmost delicacy so that the chi of the body, heart, mind and spirit can manifest through the hand to the brush tip and onto the paper expressing the subtle creativity of the artist. Likewise, the Tai Chi sword player becomes united with the sword by allowing the chi to extend to the tip of the sword. Thus the quality of the form requires the use of the principles found in the Tai Chi Form, relaxation, straightness, pliancy and awareness while acquiring the additional qualities of hand movements, nimbleness, moving from the waist and a clarity of spirit. In time the external elements of the Sword Form lead to an internalization of increased ching chi and shen chi as well as a courageous attitude. The sense of being rooted gained in the form and in sensing hands becomes even more important as one always needs to be, “under” the sword. The sensitivity and lightness of blade touch in fencing belies the effectiveness of the form as a martial art. In combat the razor sharp double-edged sword can easily disarm an opponent with the slightest touch. Hacking and slashing, qualities of Western sword combat, becomes a liability when fighting someone skilled in Chinese sword. Sword combat is no longer part of military training but training in Chinese sword develops a warrior of the spirit, a spirit that works to protect the lives, health and freedom of all people. Just as the steel of the sword is tempered for strength and resiliency the practice of sword strengthens and refines our own connection to the divine. 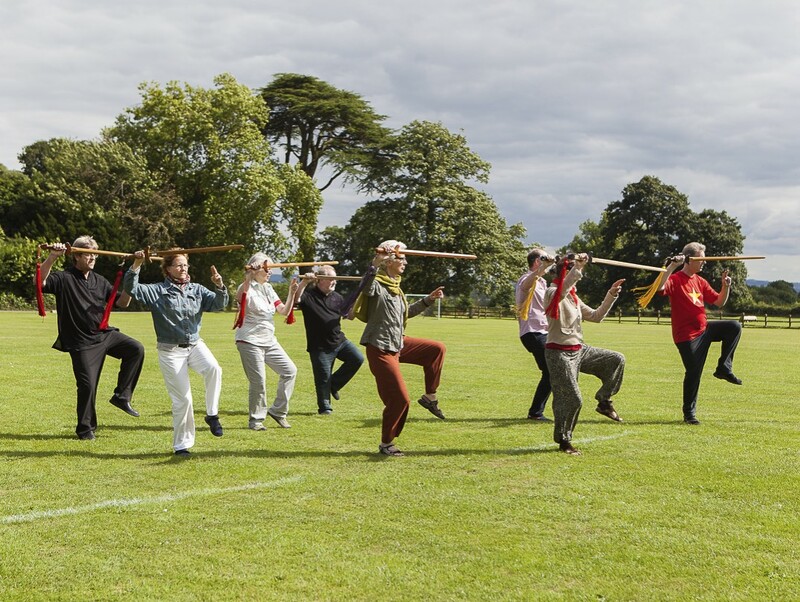 The Tai Chi Foundation is dedicated to training teachers in Tai Chi Sword Form and fencing. See our calendar for our schools and training programs.